This route begins in the area of the bus and railway station at Kolejowa street. We cross the overpass over the tracks, and step into Towarowa street. We move on along the tracks to reach the intersection with Jana Pawła II street, and then with 1 Maja street. We walk for about 900 metres up 1 Maja street, until the intersection with Piłsudskiego street. On foot – total walking time: 84 min. By bike – total riding time: 26 min. The housing estate of the Nitroza Organic Nitro-compound Plant (formerly NIZET; since 1939: Nitroza) is bounded by the premises of the chemical plant (from the south), Leśna street (from the north), woods (from the west) and a railway line (from the east). Our route leads northwards, along the blocks of flats located in Braci Śniadeckich street. The housing estate was created for the plant employees. Providing workers with accommodation was vital for the growth of the company, as many of them moved to Sarzyna (currently: Nowa Sarzyna) from the parent Boruta plant in Zgierz. The construction of the housing estate and the plant itself began at the same time, namely at the end of 1937. The residential complex was designed by a company in Łódź. Originally, both flats and fully operational commercial facilities were to be built. Finally, only two types (either single- or two-stairwell) of multi-flat blocks were built. All the blocks – whether for the engineers, office workers, foremen or ordinary workers – were two storey high, with basements. The flats were located symmetrically around the inter-floor landings. Each of the engineers’ and office workers’ flats had rooms, a bathroom with a toilet, a kitchen with a tiled stove, a pantry and a hall, of a total area of up to 55 m2. The residents could also use the storage rooms in the basement, as well as the common laundry and drying room. In the foremen’s and workers’ house, there were double-room flats, identical on both sides of the stairwell, and single-room flats in the central part. Their usable areas were either 39 m2 or 57 m2. The buildings were much alike, regardless of their prospective inhabitants. Their focal point was architectural functionality, so neither decorative motifs nor refined details were introduced. Tall and narrow stairwell windows harmonized with the front elevation windows. In two-stairwell houses, the largest (horizontal) window was in the largest room, a smaller (vertical) window was in the kitchen, and the pantry had a small square skylight. The aesthetic consistency of the buildings was accentuated by the same woodwork, painted with white oil paint. The roofs were of flat prefabricated concrete. The designs envisaged clinker facing of the base course, but the blocks were completed during the war, so, instead, more economical cement mortar was used. The pines all around added charm to the light-coloured houses. The construction works were conducted swiftly and timely, which was characteristic of the Central Industrial Region projects. The first buildings (the manager’s house and the guest house) were ready as early as the end of 1938. 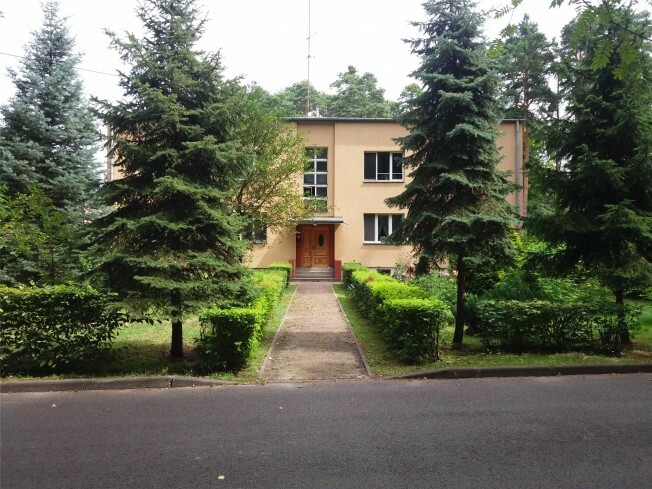 Within the estate, at Chemików street, there is a director’s residence. Just as the blocks of flats, it had two floors and was given a similar simple and neat style. Inside, there were 4 rooms, a dining room, a kitchen with a servant flat, a bathroom with a toilet. The central part contained a hall and a stairwell. Adjacent to the house was a garage. In the basement, there were a laundry, a central heating boiler room, as well as storage rooms. The usable area of the house (without the garage) was 185 m2. 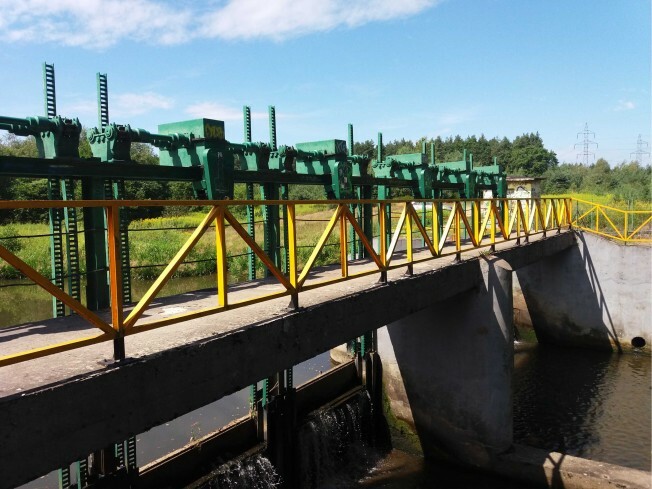 Having seen the working class residential estate in Nowa Sarzyna, we move on to the dam on the River Trzebośnica, which is about 2 km away (30 minutes on foot, or 8 minutes by bike). We go along Ks. Popiełuszki street, pass Ogrodowa street, and continue along Ks. Popiełuszki street. After about 20 metres, before the blacksmith’s shop, we turn left into a forest road. We reach the dam in about 650 metres. The dam was built as a part of the Nitroza Organic Nitro-compound Plant to provide the plant with water. Its extant machinery, from 1937, is a striking example of the technological possibilities of that time. The facility is still being used today, by the Ciech Sarzyna S.A. company. To return to the town centre, we go back to Ks. Popiełuszki street, and then turn right into Ogrodowa street. We go on to the intersection with Konopnickiej street, which leads us on to Komisji Edukacji Narodowej street. When we see 1 Maja street, we cross it and head for Kolejowa street, near the bus and railway station.